"1996 - Summer Olympics Torch Pin - Atlanta Games. 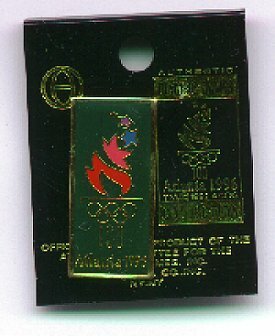 (1014) 1996 - Summer Olympics Torch Pin - Atlanta Games -Condition: Mint In Package - Never Worn. This beautiful pin is on its original Collectible Card which is done in Gold Lettering. It is marked as an Authentic Olympic Games Collection. The Pin itself is done in Red, Blue and Gold on a solid black background. (The scan was unable to show the pin with its beautiful colors and the gold print on the Card). The Pin measures 1/2" by 1 3/4". The Card it is mounted on measures 1 1/2" by 2". Price: $6.00 + shipping.